Treat yourself to the best run of all! 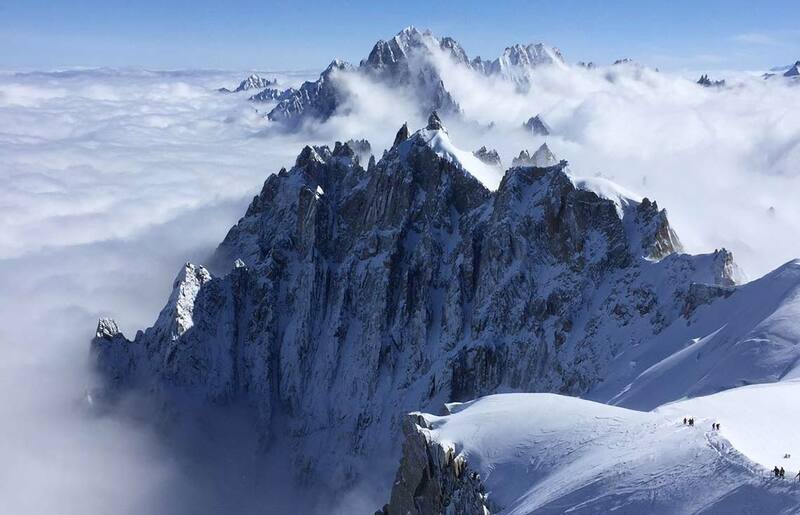 Before embarking on the legendary descent, we will fly over the amazing South face of Mont Blanc. The drop zone is at the height of 4002m on the spectacular piton des Italiens. From there we will put skins on and, keeping a regular pace, reach the top of Mont Blanc in 2h30 min via the famous arête des bosses. The descent of the Mont Blanc by the North face is a winding route that passes through seracs and steep slopes in an atmosphere of very high altitude. We will ski the North face and follow the petit and grand plateaux, passing by the Grands Mulets refuge. 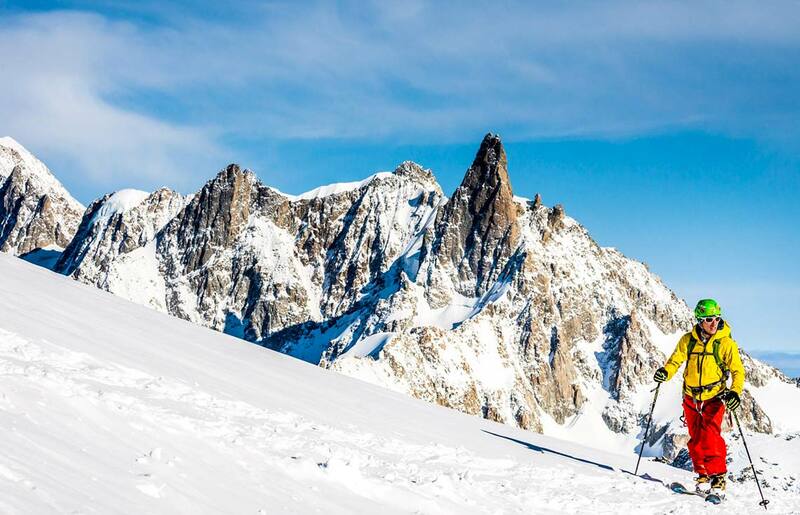 The last section which passes through seracs on the famous glacier des Bossons offers fun skiing right down into the Chamonix valley.The north facing itinerary generally guarantees a magical powder descent from top to bottom. At the top, this is where you press the pause button and open your eyes to contemplate the beauty of what lies ahead. The cost of supervision by a High Mountain Guide and the cost of using the helicopter will be paid separately to the two organizations concerned. However, for your information, the blue price shown below represents the total price that the chosen formula will cost you. 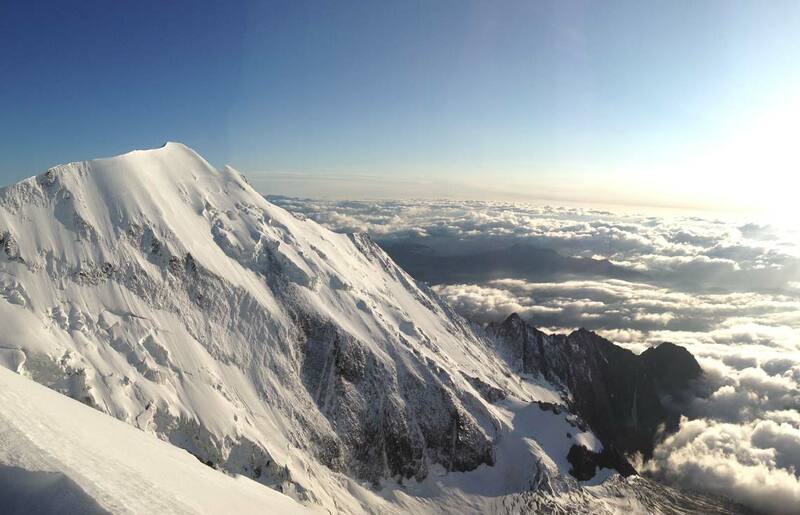 Before embarking on the legendary descent, we will fly over the amazing South face of Mont Blanc. The drop zone is at the height of 4002m on the spectacular piton des Italiens. From there we will put skins on and, keeping a regular pace, reach the top of Mont Blanc in 2h30 min via the famous arête des bosses. At the top, this is where you press the pause button and open your eyes to contemplate the beauty of what lies ahead. All costs related to the transport of people and equipment. The price of the Mont Blanc Tunnel 13€/p. see below in "ancillary costs"
ABS bag rental - 25€/p. mandatory if you do not have your own verified and in working order see below under "additional costs"
Everything that is not written in "what is included"